Many dogs can develop a food allergy. When a dog consumes such foods, dogs can develop and symptoms include itchy skin and irritation. Also, the immune system can act up and cause a reaction that keeps the dog from being comfortable. Your dog might start to reject a food over time if that dog is unable to actually consume it well. Fortunately, there are a number of foods with a natural balance that are recommended by vets and you can get for a dog that has a food allergy. These are made without many of the dangerous ingredients that can cause a dog to become irritated. 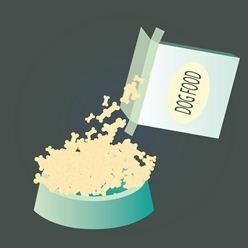 Before finding a good dry dog food, it is important to watch for what you need to avoid giving your dog. Some of the more common allergies that dogs have include issues with chicken and beef as well as soy, corn, egg, wheat, and dairy among other items. Your dog’s immune system can respond to these foods in a harmful way. It helps to avoid anything that might be artificial in nature. Any kind of color or filler could trigger allergies and their symptoms in a dog. This can even happen to dogs that do not have any particular allergies to certain proteins. 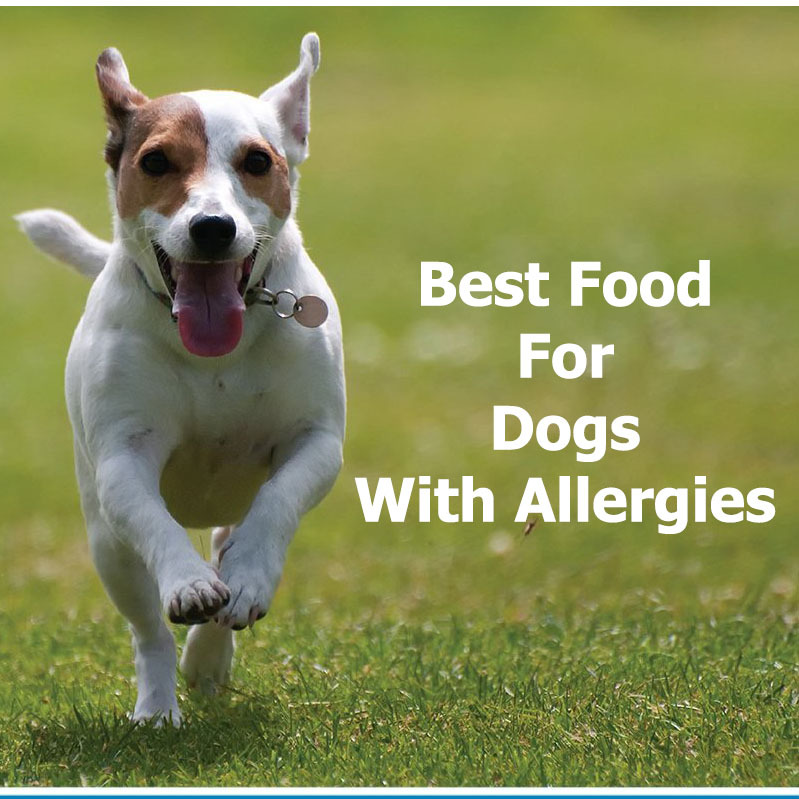 Fatty acids work well in many foods for dogs with allergies. These help to improve upon your dog’s coat. Fish-based foods are especially popular. These offer proteins and amino acids that might be provided by chicken or beef among other things your dog might be allergic to. Anything with various antioxidant vitamins like vitamins C and E can always work. These vitamins improve upon how well your dog’s immune system develops, thus keeping any potential reactions from being as severe as they could be in the future. The best thing to consider when finding good foods is to look for options that are fully organic and easy for your dog to consume. This is all about giving your dog more control over having a healthy diet. A key part of this food is that it contains real salmon as well as fish meal. These offer high amounts of protein that are easy to process. Also, chicken meal is used but not straightforward chicken is applied, thus keeping this common allergen from being a threat. This is also a grain-free product. It uses omega-3 and 6 fatty acids to restore your dog’s coat just as well, thus giving it a healthy feel and look all around. It also contains traces of glucosamine, a compound that is naturally found in many fish-based products. This not only improves upon your dog’s digestive system but it also assists in lubricating your dog’s joints. This in turn makes it easier for your dog to move around without risking any pains or irritation. 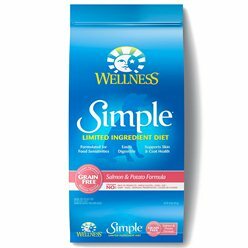 Wellness Natural makes this product in salmon and potato plus salmon and pea flavors. These are made with no gluten or wheat products or other dangerous fillers that your dog might be allergic to. The added salmon especially creates a comfortable body. 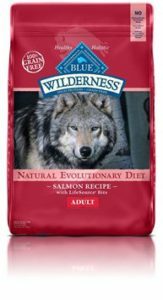 This uses salmon with healthy fish oils to provide your dog with healthy protein. 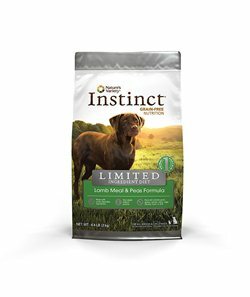 This especially mixes in well with your dog’s diet as it offers lean meat. The carbohydrates are also easy to digest. There are no artificial colors in this food either. 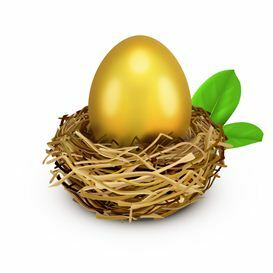 The natural design of this product is a critical point of what makes it popular. This uses a grain-free recipe that has no gluten or beef, chicken, dairy, or egg-based ingredients. Omega-3 and 6 fatty acids are also added to this product. This helps to add a comfortable texture that keeps your dog healthy while one’s coat and skin will be kept under control. Everything is digestible and easy to break down. This even comes with a green tea extract coating on each of the kibble pieces. This is added to create a better flavor while also providing your dog with antioxidants. These help with restoring the dog’s immune system. You can also get this in duck and turkey flavors. These two can make for good options although you should see if your dog is capable of handling the lamb recipe first. One point for certain is that whatever protein your dog consumes will be the only protein included, thus providing a healthy amount. You can always add supplements to your dog’s food to make it easier for your dog to have a healthy diet. The Olewo Dehydrated Red Beets supplement is a good example. It relieves skin allergies and improves upon your dog’s metabolic rate while also providing your pet with healthy antioxidants. The Amazing Nutritionals Omega-3 Chews are also great for giving your dog a comfortable way to take in critical fatty acids needed for a healthy coat. But remember, these supplements should only be used alongside healthy foods for dogs with allergies. No supplement should even be a full replacement for proper health. This does not mean that supplements should be avoided. Anything that boosts the immune system and helps a dog to recover from any prior allergic reactions always helps. Check out all these great foods for dogs with allergies when looking for something healthy for your dog. This should provide your dog with the nutritional needs your pet has without risking commonplace problems relating to allergies. Check carefully on what the foods you are looking into have so you will have a great choice that adds enough support for your dog’s body.